Do you have a minute to spare to learn some English? Here's Kee to keep you up to date with a lesson about be going to and the present continuous for future plans! Give us 60 seconds and we'll give you the English! Hi! 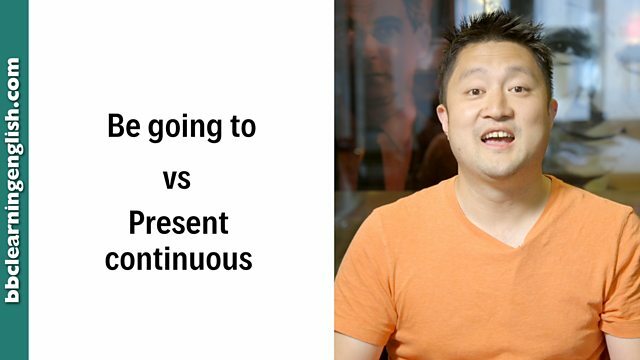 This is Kee from BBC Learning English, and today I'm going to tell you the differences between be going to and the present continuous to talk about future plans. We use be going to to talk about future plans. The plan will probably take place, but it's not a definite plan. If I say: I'm going to meet my friends this weekend. It means I made plans with my friends, but it could mean that we haven't decided where to meet, nor have we decided what time to meet. On the other hand, we use the present continuous to talk about future plans that are almost definite. If I say: I'm meeting my friends this weekend, it means I made plans with my friends, and we may have decided where to meet and what time to meet. So, this plan is almost definite and it's difficult to cancel. So remember, the present continuous describes a more definite plan than be going to. Be going to is followed by a bare infinitive verb - a verb with no 'to'. Don't forget to change the 'be' verb to the correct form to agree with the subject pronoun! She's going to be very angry. They're going to be late, I think. The present continuous tense is formed using the auxiliary verb be + (verb)ing. Be careful of state verbs, such as know and need, which are only rarely used in the continuous form. I'm working! What do you want? We're having a party. Would you like to come? Be going to is often used with future plans which will probably take place, but have not been formalised. This means that the exact details, such as what time and where, have not been agreed on. I'm going to meet my friends this weekend. He's going to fix his car later today. We're probably going to take the train to get there. The present continuous is often used with future plans which are almost definite. The details have been decided on and everyone involved knows where they need to be and when. I'm meeting my friends this weekend. She's having dinner with the president of the club tomorrow evening. How do you form verb phrases with 'be going to' or the present continuous? Which of these verb forms is NOT correct? Can we use any verb with the present continuous? What do we need to be careful of when using the present continuous? Are these future plans almost definite or do they sound like they are probable, but may not happen? Complete this sentence: We ______ somewhere next summer for a holiday, but we haven't agreed on the destination or bought the tickets.